The celebration known as Carnival has no singular description. In Trinidad and Tobago, it's celebrated before Ash Wednesday, sometimes with participants rubbing down their bodies with mud and paint. In the Bahamas, it takes place around Christmas, stemming from the time slaves were permitted to spend time with their families around the holidays. In Martinique, Carnival is celebrated in the days leading up to Lent, and often includes a massive bonfire around Ash Wednesday. "Carnival really straddles a lot of different modes," New Orleans curator Claire Tancons explained to The Huffington Post Arts. "It's an artistic practice, it's a mode of public address, it's a tool for resistance. It's a touristic device. It is not one thing for one person." Ebony G. Patterson, Invisible Presence: Bling Memories, performance, April 27, 2014, Kingston, Jamaica. Courtesy of the artist and Monique Meloche Gallery, Chicago. 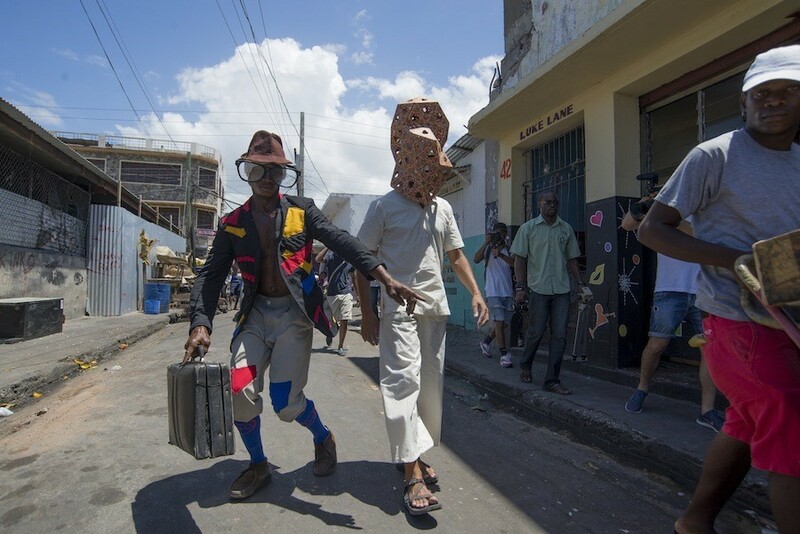 Tancons is the co-curator of "En Mas: Carnival and Performance Art of the Caribbean," an upcoming exhibition at the Contemporary Art Center in New Orleans. The exhibition, also curated by Krista Thompson, art historian and professor at Northwestern University, explores modes of contemporary performance art that are influenced not by the dominant trajectory of the European avant-garde, but by the Carnivals of the streets. Often such carnivals are spurred not by aesthetic experimentation but by independence struggles, civil rights movements, and population migrations, to start. "Carnival has the ability to reach out to the social sphere and the public space," Tancons continued. "It can be rowdy, it can be spiritual -- by deed of it being both a popular festivity and one which is steeped in religious and spiritual tradition, one which is neither pagan nor strictly religious. It is also a very powerful mode of artistic expression and element of cultural identity." The project of "En Mas" is threefold. First, Tancons and Thompson commissioned nine contemporary artists, all with roots to Caribbean tradition, to each stage a performance. The performances were spread throughout different locations throughout Carnival season in 2014. (If you couldn't tell from the aforementioned examples, Carnival season extends to almost a full year, depending on where you're standing.) Nicolás Dumit Estévez performed in the Dominican Republic, Marlon Griffith in Trinidad, Ebony Patterson in Jamaica. Nicolás Dumit Estévez, C Room, 2014 at Museo Folklórico Don Tomás Morel, Santiago de los Treinta Caballeros, Dominican Republic. Photograph: Raymond Marrero. The second phase, which is currently in motion, is the exhibition at the Contemporary Art Center in New Orleans, an effort, as Tancons explains, "to bring performances back into the museum context." She explains: "It's really going to be a survey of modes of presenting the afterlife of performance." Each artist's challenge is to adapt his or her performance to fit the gallery sphere, thus shifting the mechanics of the thing from public to private, from for the many to for the few. 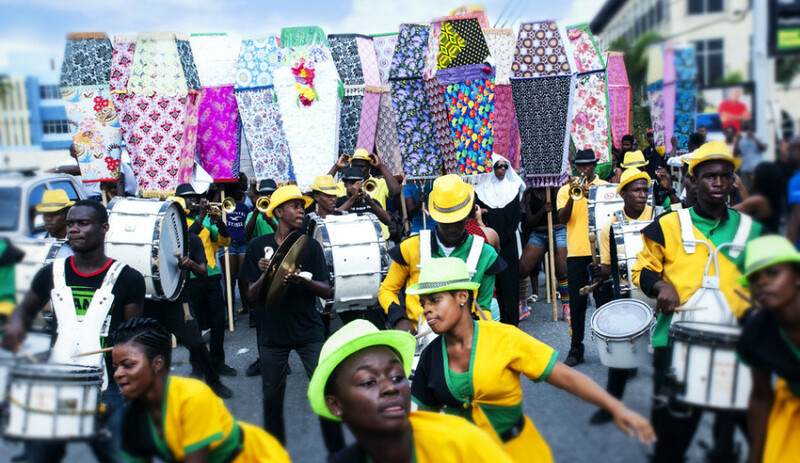 Each artist takes an individual approach in archiving and representing their past performance -- the coffins used in Ebony Patterson's Jamaica performance will be on display along with a three channel video projection documenting the original. Marlon Griffith will display costumes used, as well as one major monumental element re-fabricated and scaled down for the gallery display. The exhibition, part archive, part artwork, displays past relics alongside replicas of lost, destroyed or immobile objects, blurring the line between documentary and performance in itself. "It's interesting to follow the fates of these different objects and appreciate the value they've incurred depending on the use that is made of them and the way they are presented," said Tancons. "That's something I wanted to highlight." Tancons and Thompson are aware of the precarious role they play, adapting the all-embracing rituals of parade and performance to fit into a (sometimes very stuffy) white cube. However, for Tancons, the main shift took place in the project even before the museum was involved. Charles Campbell, Actor Boy: Fractal Engagement, performance, April 21, 2014, Kingston, Jamaica. Photograph: Marvin Bartley. "As you know the title of the exhibition 'En Mas' is a pun, on the idea of mas as short for masquerade and en masse, which stems from a French expression to be in a mass, in a group. Since the beginning I have been questioning: Who were the masses in en mas? The question of the masses could already be felt and critically dealt with during the performances themselves. Who had access to the spaces of the performance? How could space be cleared for some of the public performances to take place? "Depending on the modes of engagement the artists chose, they encountered various difficulties. Ebony Patterson had difficulty obtaining a parade permit. The question of the masses need not only be posed in the gallery context. 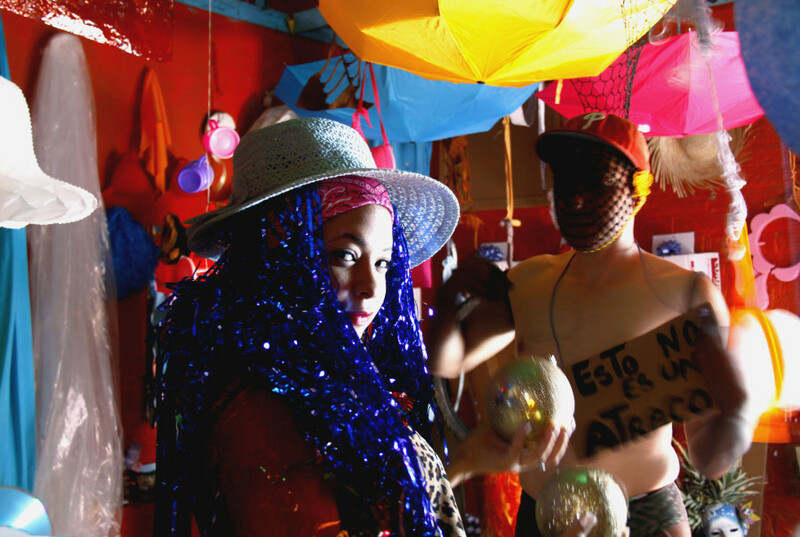 It is already present in the very translation of the notion of Carnival from one that is understood to be popular to one that may be more rarified... An artist like Marlon Griffith questions the fact that a contemporary Caribbean audience used to witnessing Carnival should not be able to also appreciate more challenging, more critical contemporary artistic production in a medium with which they are already familiarized. The translation from, not so much the gallery space, as maybe an artistic discourse, could already be felt in the streets. 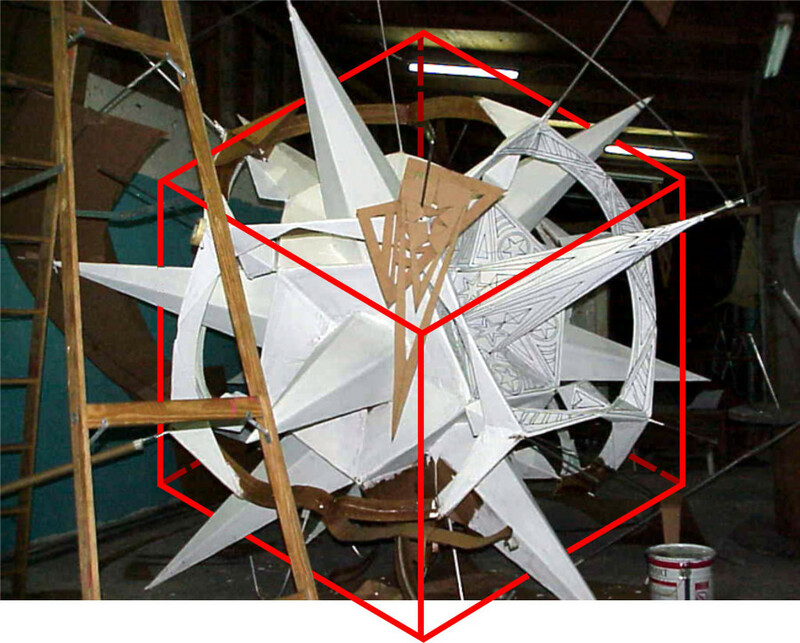 What is that Carnival space and who does it really belong to?" John Beadle, Inside-out, Outside-in, 2014, Nassau, The Bahamas. Image courtesy of the artist. For Tancons, the final phase of the project is especially important, as that is when the exhibition will, in the care of Independent Curators International (ICI), tour throughout institutions in the Caribbean as well as other destinations worldwide. This gives the exhibition the chance to come full circle, as audiences of the parade overlap with those of the gallery space, allowing the two performative worlds to collide. "First of all, it's not that often that contemporary art travels to the Caribbean. But also, the reason why we attempted the feat of covering various key landmarks in a Carnival season was to be able to show them to all these different populations who may only ever have previously only been able to witness their own cultural event. Now they will be able to appreciate those of the neighboring islands. In one exhibition you have an entire year worth of Carnival." The exhibition is as much a lesson in alternate art history as it is an abbreviated tour through Caribbean customs. "In the context of contemporary art and the discourse thereof, it is one of the cultural traditions through which artists of Caribbean descent have found a path toward performance. At a time when the discourse of performance is so prevalent within the contemporary art context, it's important for me to highlight these genealogies of artistic practices and where they stem from. They were not inspired by the European avant-garde of the last century, which is the discourse usually associated with performance art. Instead they were inspired, at least in part by, some of these cultural traditions which offer an incredible repository of creative practices." "En Mas: Carnival and Performance Art of the Caribbean" features artwork by John Beadle, Charles Campbell, Christophe Chassol, Nicolás Dumit Estévez, Marlon Griffith, Hew Locke, Lorraine O’Grady, Ebony G. Patterson, and Cauleen Smith. The show runs from March 7 until June 7, 2015 at the Contemporary Art Center, New Orleans and is organized as a traveling exhibition by Independent Curators International (ICI). Marlon Griffith, POSITIONS + POWER, 2014, Port of Spain, Trinidad. © Marlon James, 2014. Cauleen Smith, H-E-L-L-O videostill. Location: Booker T. Washington Auditorium. Cello: Monica McIntyre. Cinematography: William Sabourin, 2014. Correction: An earlier edition of this article stated Trinidad celebrated Carnival in June and July. We regret the error.